How prepared are you to survive a deadly encounter? That’s a question that we don’t ask at parties and around the dinner table yet everyday thousands of citizens, just like you, are meeting evil in the streets, parking lots and even in their own homes. Unprepared and caught off guard, we can fall victim to ruthless crime and have our possessions, peace of mind, and even our lives taken from us. If you are like a lot of us, you probably believe you can outsmart, out talk or even out wit the assailant. Maybe so, but the one factor of your survival that can’t be truly measured unless tested is how you handle fear. Fear can cause so many unexplained actions and those fear induced actions may wind up making a bad situation even worse. 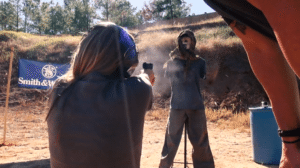 Nationally recognized self defense and firearms instructor EJ Owens, takes 4 average, everyday women and places them in some pretty bad situations, that thousands of citizens find themselves in everyday, to see what they would actually do. They will have to control their words, and their actions but most importantly they will have to control their fear. Will their instincts kick in? Will they find a way to survive? Or will the fear be too much for them to handle? Their reactions might surprise you while the situations they get in just may terrify you. Hang on tight as we ride along with them during their journey to find fearless. Finding Fearless is brought to you by Smith & Wesson and Crimson Trace.